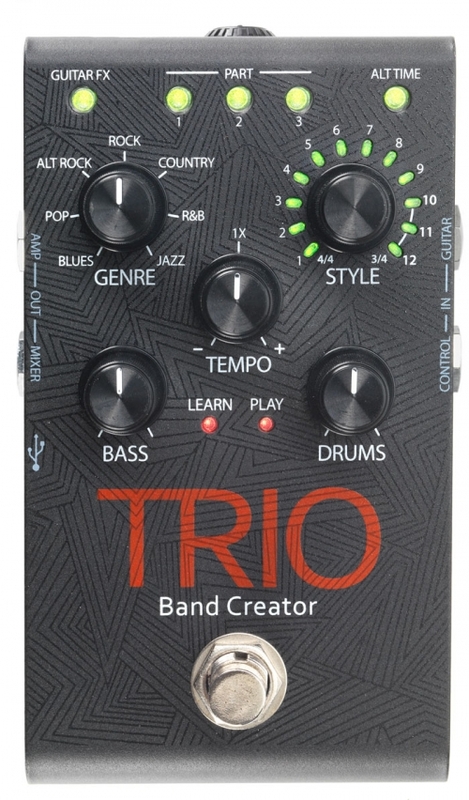 “The Trio listens to the way you play and automatically generates bass and drum parts that match your song. Just plug your guitar into TRIO, press the footswitch to teach TRIO your chords and rhythm, then press the footswitch again to start playing with your own personal band! The TRIO provides seven music genres to choose from including: Blues, Pop, Alternative Rock, Rock, Country, R&B, and Jazz. Up to twelve song styles are available for each genre and you can select between 3/4 and 4/4 time signatures. The TRIO can learn up to 3 different song parts which can then be recalled on-the-fly as the song plays back. An optional DigiTech FS3X Footswitch can be connected to the TRIO for easier, hands-free selection of song parts and styles. So what, old news right. The only reason I’m mentioning it right now is that we at Pedal Finder know that finding people to play with can be difficult at times. Jamming out in your bedroom for your dog or cat can only take your imagination so far. Having the inspiration of a backup band to surround your sound almost always pushes the creative juices in new and exciting directions. We think the Trio has the ability to help you up your game. Also because this all-in-one pedal is currently only $175 at Amazon with free shipping. This band-in-a-box MSRPs for $295.95 so its’ a steal. Do you own this pedal? Do you like this pedal. Leave a review and let everyone know at Pedal Finder. I like the idea and most of the features. I do have some suggestions that if implemented would make the trio way more powerful and worth much more to the musician. If the Trio stored a number of generated tracks and could produce a MIDI signal It would be a hell of a tool. Then I could record the material for editing. If the store tracks feature playing live would be greatly enhanced.